Ninotchka Beavers is an accomplished artist, author and photographer in Dallas, TX. She loves cooking, party planning and kitchen design, and her famous Elmo cupcakes have been featured on WomansDay.com. 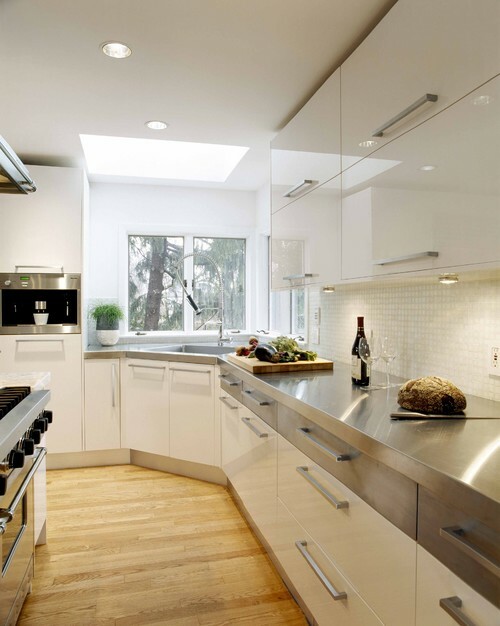 Let’s forget for a moment that stainless steel countertops are practically indestructible and that their use virtually eliminates worries about temperature damage, stains, food safety and health concerns. Functionality is all good and well but let’s talk about how fabulous these would look in your modern kitchen. There’s just something about that sleek, high-end industrial style, isn’t there? We love it. Stainless steel kitchen counters create a cohesive look in your kitchen, at once complimenting and completely integrating your stainless steel appliances such as built-in stainless steel cooktops, refrigerators and pro-style ranges. Add an equally functional and fashionable integral or undermount stainless steel sink to complete your all stainless steel kitchen design. Unlike other surfaces which can chip, dent and scratch or simply look dated, their durability and timeless elegance will keep your kitchen looking fresh and updated for many years to come. 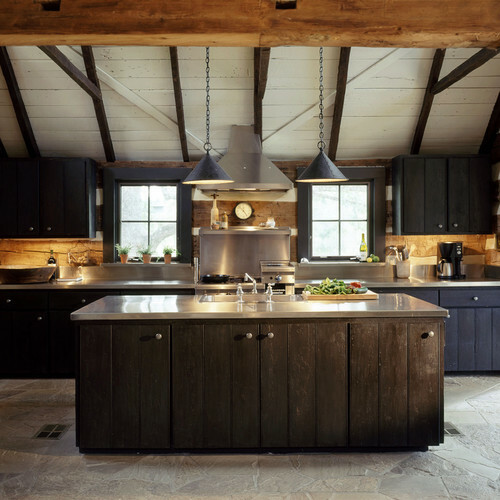 Small or dimly lit kitchen? No problem. Your stainless steel kitchen counter reflects light creating a gorgeous, bright atmosphere that enhances the entire food prep and cooking experience. There truly is no other surface that offers so many dynamic, stylish and convenient qualities. Stainless steel countertops have long been used in busy restaurants and commercial kitchens the world over. Just imagine the daily wear and tear they endure in such settings and then think about how that translates to your docile-by-comparison home kitchen. Stainless steel counter tops will stand up to the most diverse of uses. Providing an accommodating and convenient temperature environment, they will absorb the heat of a hot pan or dish directly from the cooktop or oven and provide a cool surface for rolling out a variety of doughs and pastries; which brings their hygienic properties to mind. With their non-porous finish, stainless steel countertops are the ideal setting for food-to-surface contact without the worry of lingering germs or the propensity for bacterial growth. Clean up is easy, comprehensive and effective. If you’re feeling a bit non-commital, a stainless steel kitchen island is a fantastic compromise. Providing durability, functionality, food safety and style in your kitchen, stainless steel counter tops are definitely something to consider when designing what is arguably the most frequented and beloved room in your home. Interested in an all stainless steel kitchen? Browse stainless steel appliances at Designer Home Surplus.